The "Simple Plan" was chosen as a doorway into this story for a few reasons; it marks the time that alarm bells began tolling, it introduces a number of the people we will see in other events described on this website, and many things seen here in isolation will be later recognised as a continuation of long established patterns played out before this and even, unfortunately, to the present time. It must be noted first and strongly that nowhere in the “Simple Plan” narrative is Dolores seen as having any say about what she wants or what she chooses. Even in the attempt by her daughters to visit her, she was not asked "When would be a good time to see you, mom?" None of the three sisters ever spoke to her about it. Any decisions about this visit, had it been allowed, would have been made by Ethan. This scenario of control and isolation is seen over and over in cases of Elder Abuse and has been recognised as a major indicator. The notable exception here is when Dolores made plans with Saoirse for the Friday and Saturday. Ethan's patterns include the use of proxies. We observe it here clearly in Ronan taking direction from him. At this time Ronan still had some resistance to Ethan, as will be seen. This would rapidly fade to the point that Ronan and Ethan were barred from the hospital after witnesses observed them physically hurting Dolores, defenceless in her bed. Sophie's relationship with Ethan is noted; she too acts at different points under Ethan's orders. Apart from Ronan, she has the most interaction with Ethan, and the least restricted access to Dolores. 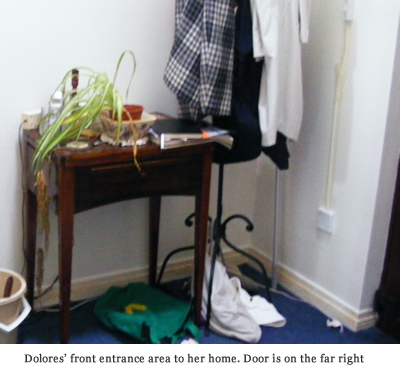 In these interior images of Dolores' home, bear in mind that the house had long ago been “sanitised” by Ethan. He hired a skip (aka dumpster) the day before Dolores was admitted to the hospital. During the late evening to early morning hours Ethan filled it with various items, including Dolores' favourite chair, which he broke into pieces. It was only after this “sanitising” was completed to a certain degree that he called the Medical Response Unit that rushed Dolores to the hospital. At this point she was unresponsive. [Editor's note: Indeed, Dolores had stopped breathing at one point. It is reasonable to conclude from other evidence that Ethan at this time considered and fully expected his mother to be effectively dead. In the above image of Dolores' front entranceway, the door is to the far right. To the left of the coat stand is the sewing machine. Notice the wiring on the wall to the right of the coat stand. 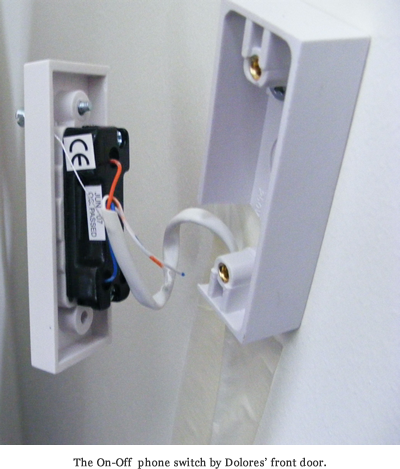 It consists of a standard Eircom landline socket below, with wires taped to the wall leading to an on/off switch. Note also the little box with the wire on the rear left corner of the sewing machine. 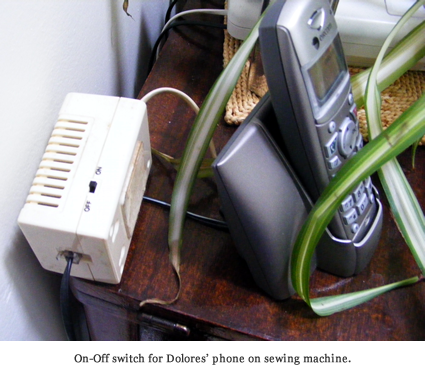 A simple switch, this turns off her landline. Anyone calling will just hear the call ring out. Another layer of isolation; this is the switch on top of Dolores' sewing machine. The cordless phone and CallerID are also seen. Dolores did not have voicemail set up on either her landline or mobile. Ethan had control of Dolores' phone account, and there are many premium services added on to it. Ethan had the phone number changed before her hospitalisation (telling Eircom it needed to be changed because of "harassment") and then cut off service altogether. We'll leave much more phone related information to other pages on this site. In his letter to the Bray Gardai, Ethan immediately brings up the “taxi issue”, and only mentions the doctor's visit later. This of course is in opposition to Saoirse's account, where Ethan used Dolores' appointment (with his physiotherapist at 8:30am) as the reason for his appearance in Rosslare and for the need to rush Dolores away. Saoirse makes no mention of anything to do with a taxi in any of her texts or letters, and in fact is adamant that no taxi of any sort was ever mentioned during that visit, with the exception of Ethan saying he wasn't a “taxi driver” as he forced Dolores into the front seat of his car. In his letter, Ethan refers to the doctor's appointment himself as an “alleged appointment.” Confirmation of this appointment to our knowledge has never been produced or found through many attempts. It is reasonable to think that a doctor's statement would be a more compelling buttress to Ethan's account than relying on a taxi booking for a ride that never occurred. Nonetheless, Ethan in fact relies on this taxi booking heavily. We have to conclude that no doctor's visit was scheduled at all, but rather invented as an excuse to take Dolores away from Saoirse. It being difficult to coerce a doctor to provide a false statement, we believe Ethan quickly invented a taxi booking, and having a relationship with this driver, was confident that he could get a document from him to confirm his statements of events. Certain words and phrases recur in his communications, such as: inappropriate behaviour, badgering, bullying, authority, respect, demand, abusive, financial, documented, you may wish, report, etc. In this letter, a few of these words are used. Ethan makes no mention in his letter of either leaving Dolores' house the first time, or a detour into the Dublin Mountains to see an associate. The approximate travel time from Dolores' house to Ethan's house is just under two hours. We see by Saoirse's text at 9:38pm that Ethan had already left, and she was with Ronan, having completed the ten minute walk to his house. Being generous, we can safely say that Ethan left Rosslare no later than 9:30pm, arriving three and a half hours later to his house where the Gardai were waiting. This elongated travel time might be explained by Ethan being very cautious about what he said were dangerous driving conditions. The weather records between the hours of 5:00pm and 1:30pm show scattered clouds and a temperature between 1°C and 3°C. or between 34°F and 36°F, lending at least some plausibility to the bad road scenario. Dolores reported that he went to see his friend in the Dublin Mountains, a person she had met once before. A trip from Rosslare - Dublin Mountains - Bray takes between 2 hours and 45 minutes to 3 hours. We end “A Simple Plan” where it began: the text from Dolores' phone to Saoirse. Years before that text, he used one of his associates' phones to text a former girlfriend, shortly after she left him. [Editor's note: We have knowledge of two relationships Ethan had, neither long-term. We know of no others and suspect that is the extent of his non-casual relationships with women.] The contents of this text are so vindictive, hateful and obscene that we choose not to display it here. As would be expected, Ethan's use of phones to send abusive, vulgar, and threatening texts is not limited to Dolores' phone, but includes his own and the phones of other family members and non-family individuals. His targets for these communiques are also quite broad. His use of Dolores' phone, of course, illustrates clearly that Ethan exercised control over it. [ Editor's note: The narrative of Dolores' Last Year continues with The Silence of Friends.